Matt Flynn – It’s easy to look at the 6 for 13, 31 yards and scoff. But if you do that please add a completion for 46 yards and a TD, because it wasn’t Flynn’s fault T.O. dropped a gorgeous sure fire TD pass (too much butter on Terrell’s popcorn?). Owens was targeted 5 times by Flynn, none were completions, and I’ll leave it to the coaches to decide whose fault it was. My guess it was on T.O., since Flynn knows this offense like second nature. So if you add this all up, it’s hard for me to be down on Flynn when it was obvious Pete was trying to work T.O. into the passing game, maybe against the better wishes of Flynn. Overall I though Flynn looked fine, running the offense without problem. I think Flynn should start next week and start week 1 at Arizona. 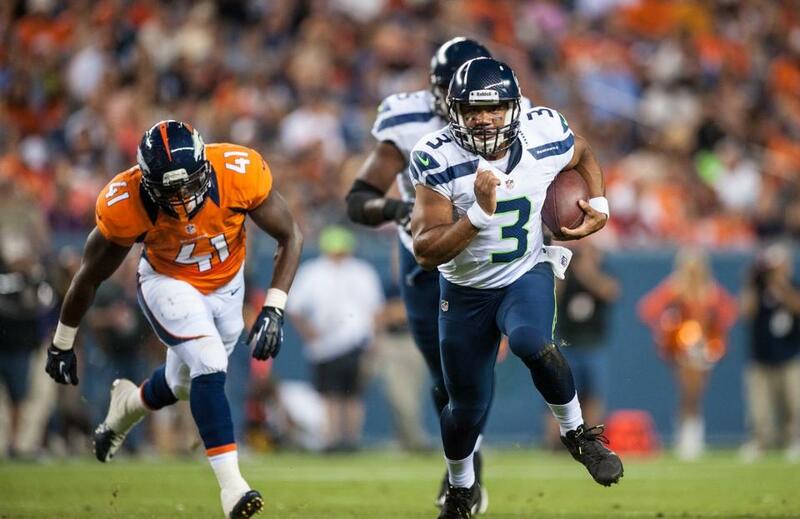 Russell Wilson – Wilson, for the second week in a row, played outstanding. He made all the passes, and even scrambled 5 times for 33 yards, averaging 6.6 yards a rush. Add to this his 9.1 yard average per completion, and it’s easy to see Wilson has no trouble running an NFL offense, albeit against Denver’s second string defense. Wilson is supremely confident, and his leadership is apparent. The current debate is whether Wilson should play next week against Kansas City’s number one defense so we can see what he can do verses a solid defensive scheme. I understand the sentiment, and in a perfect world, yes, play him verses KC. But this is not a perfect world. Sept 9 is just around the corner, and Flynn needs all the reps he can get with the ones to build timing. I think the Hawks have a great problem on their hands, both Wilson and Flynn can play, and play well. It’s a far cry from Jackson and Whitehurst. Let’s hope Seahawks fans don’t forget that. Marshawn Lynch – Lynch played a couple series and looked great. Beast Mode is back. 6 carries for 37 yards for a 6.2 YPC average. The offensive line opened up some nice holes. It is extremely clear the Seahawks love to run the ball. It’s their bread and butter. The ease at which they run left, or run right is fun to watch. The great thing about a solid running game is it translates. Road, away, good weather, bad weather, no matter, just hand off the ball, get chunks of yards and move the chains. Special Teams – Steve Hauschka was automatic. The Hawks punt protection though? Horrible, two blocked punts by the Broncos. Gotta tighten that up. Defense – Mixed bag here. The Hawks got very little pressure on Manning, which allowed him to dink and dunk the Hawks to death on a couple drives. The flip side of the coin though was the three turnovers forced. I think this could be the story of this defense all year. Big plays, turnovers, stopping the run, but giving up a few drives here and there. Overall I was pleased with the turnovers. Breno Giacomini – The dude has a serious mean streak, which I love, but multiple personal foul penalties is just stupid. Those kinds of brain dead moves could cost this team a win in the regular season. I love his passion but he’s got to control it, because we all know defensive linemen across the league will try and bait him. For the second straight week, I am very pleased with what I saw. The running game was powerful and consistent; the passing game was extremely conservative, but not terrible, while the defense made big plays. Areas to improve, again, are the pass rush which could be a major Achilles heel all year, and punt coverage. Expect the starters to play 3 quarters this week in KC. Much more can be concluded after the next game.